Campaign stall providing cycling information and advice for local residents, including Bike Week events in Taunton. 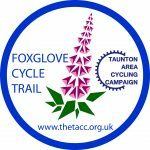 Free distribution to local residents of the new Foxglove Trail leaflet produced by Taunton Area Cycling Campaign (funded by Taunton Deane BC Unparished Fund). Promotion of our proposals for the development of the future Taunton area cycle network. The Trail follows some of the towns traffic free paths and mainly quiet roads. It is suitable for all participants, particularly families. Children under 14 must be accompanied. Please email contact@thetacc.org.uk to book your spaces. The table below summarises progress in 2017 under 10 headings. 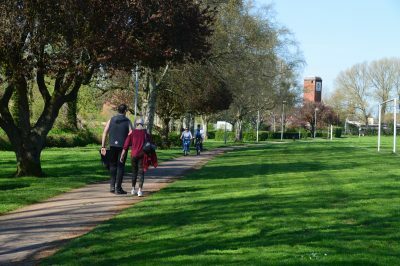 1 Taunton cycle and walking map Updated and published. 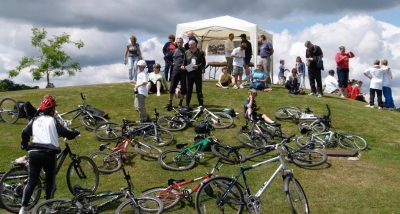 In conjunction with Sustrans, TDBC financial support. Strong demand. Promoted at TACC stalls especially in town centre. 2. Major Scheme Bid for major network improvements (over £5m) SCC have agreed to work with TACC on this. SCC have won funding to start technical work on local cycle and walking improvement plan. Awaiting growth fund allocations to the LEP. 3. Staplegrove Urban extension Statements at two planning meetings and meeting with developers. Commitment to ongoing engagement. 4. Firepool Petition for change of policy on no cycling on the Boulevard got 540 signatures. Resulted in change of policy. Needs agreement of many details including demarkation of the cycle provision. 5. Coal Orchard Direct engagement with TACC on details of NCN and other design aspects, following on from TACC’s reps at planning committee. Station Road Going forward as SIS bid following TACC representations. Promoted by Cllr Coles and supported by Cllr Hunt. SCC have collision reduction proposals for station acces. TACC site visit. Six members compiled a table of suggested improvements. We met councillors on site to explain our ideas. Market cobbles No progress. Injury collisions still occuring. Opportunity through public realm improvements. J25 Bid for funding put forward by SCC. Potential HE funding. HE are funding options study. Vital link to Nexus 25. Wellinton-Taunton link No significant progress. Needs major scheme bid. Mount Vets access has damaged existing cycle path. Bishops Lydeard-Taunton Parish council cycling group still considering if to consult land owners. Needs major scheme bid. Compass Hill Gyratory SCC are looking for ideas. Still waiting promised 1:500 plan from SCC. Crescent Roundabout SCC looking at scheme to tighten up the roundabout. Obridge viaduct and low level route Scheme put forward for SIS funding following TACC representations. To include link from Wickes cycle path, more effective signing and lining. Leycroft Ave subway Resurfaced. Not machine laid. South Road/Shoreditch Road No progress. Canal towpath Improvements proposed as part of TDBC public realm consultation and as part of Firepool. Creech Castle junction Improved at grade crossings proposed including single stage crossing of Toneway. SCC hosted design workshop where TACC’s ideas were examined. 6. Grow TACC membership support base to 500 490 supporters mid Nov 2017. TACC have run 6 successful stalls. 7. TACC Website Website created. Further work needed to change domain name and get file hosting to ensure higher prominence on Google. 9. Building group publicity and information resources TACC business cards, 2 banners, key rings and poster designed and produced. 15 hotspots and 50 issues maps and survey report. Produced and presented to Taunton Deane and Somerset County Councils. TACC polo shirts produced. Established recognition from the local authorities. Taunton Deane Council TACC statement and map presented to Taunton Deane with survey report. Statement to Taunton on Firepool. Statement to Taunton Planning Committee on Firepool, Coal Orchard and Staplegrove. Distribution to Councillors and officers Making Space for Cycling report. Somerset County Council TACC statement and map presented to Somerset County Council with survey report. Meeting with Councillor David Fothergill and Councillor Roger Habgood. Regular meetings with David Mitchell and other Highway officers. Liaison with Councillors Hunt, Coles and Willliams on SIS schemes. MP Meeting with Rebecca Pow MP April 2018 to discuss A358, cycle network development and design issues. Develop quality network tube map Draft map produced and used at various meetings with councils etc. TACC is having a stall at the Rotary Charity cycle ride this year. The date for this major fundraising Cycle Ride is set for Sunday 6 May 2018. This year the regular 50/50 is a fundraising event for Taunton Communication Hub sponsored by the Rotary Club of Taunton looking to develop a new Community Hub in the heart of Taunton. The aim is to provide a web and social media platform for all, a Community Corp to provide an effective registration and management system of volunteers and a new open door community facility. You can donate 50% of your sponsor money to a charity of your choice. Options include a family friendly 4 mile walk from Richard Huish College to Cotlake Hill and back and 10 mile (16km) 15 mile (24km) 21 mile (34km) and 46 mile (74km) cycle rides. The routes are at Rotary’s website (pdf with map). The need to do more to improve cycling and walking came up many times at tonight's well attended environmental hustings.